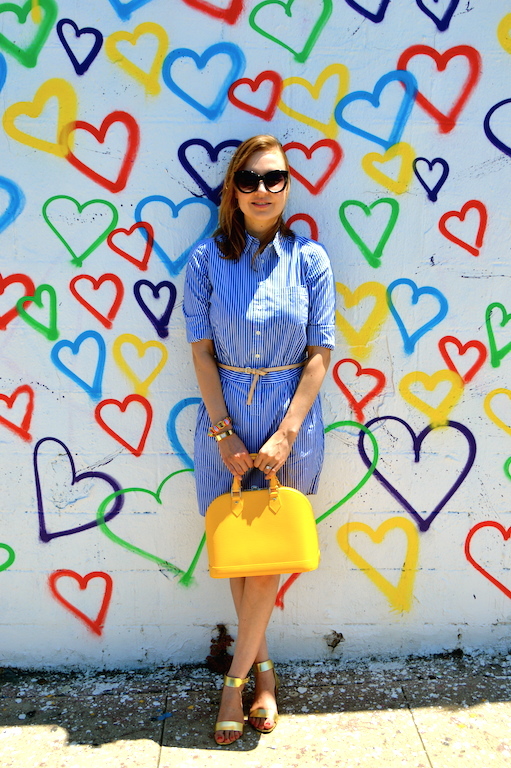 Hello Katie Girl: I Heart Shirtdresses! Summer break is almost here (one more week!) and in preparation I am furiously adding things to my "Things to Do in Los Angeles" list, which is now up to nearly 50 awesome places, restaurants, museums, historic sites, and other random curiosities around the L.A. area. I have recently added to my list a sub-category entitled "Walls to Visit". My husband thinks I am off my rocker that I would go out of my way to visit something as trivial as a colorful wall, and there might be some validity to his view, but what I have done is paired each wall with a corresponding place, restaurant, museum, historic site, or other attraction nearby so that I am not just traveling 30 miles for a pilgrimage to a colorful wall. 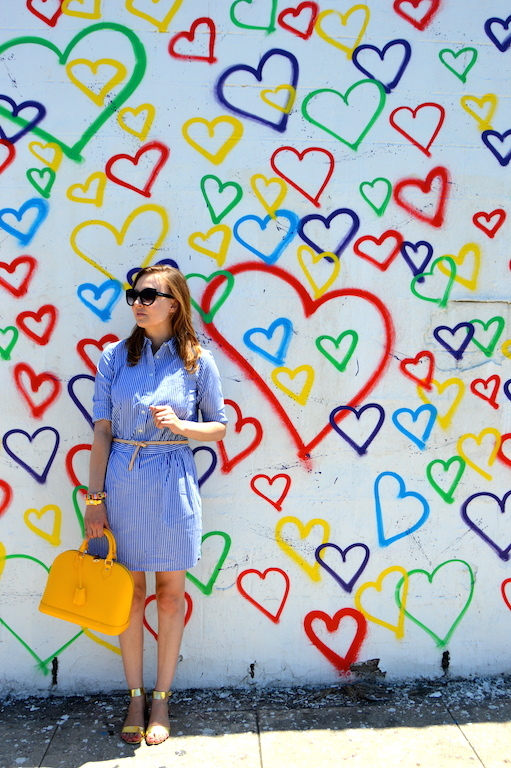 I applied this philosophy of pairing a wall with an adventure to a unique part of the city last weekend when we visited this colorful, darling heart wall located in Atwater Village, which is an up and coming hipster haven. Last weekend there was a sample sale for Clare V. a few blocks away, so it was a perfect pairing. I knew that my husband would not want to go to either this heart wall or the Clare V. Sample sale, so I enticed him with the prime rib at Tam O' Shanter, a historic restaurant across the street from the wall. It turned out that the Clare V. sample sale was a zoo with a line stretching around the block, not to mention that my husband couldn't find any parking, so that was a bust, but we did get these fun pictures at the heart wall and a tasty lunch at Tam O' Shanter. Do come join me this week for the linkup pretty lady. Thanks and have a fabulous weekend, Katie! Well I think your "walls to visit" list is a brilliant idea, especially since you paired them with other things to make the visits more enticing. Adding a good restaurant would make my husband more eager as well. 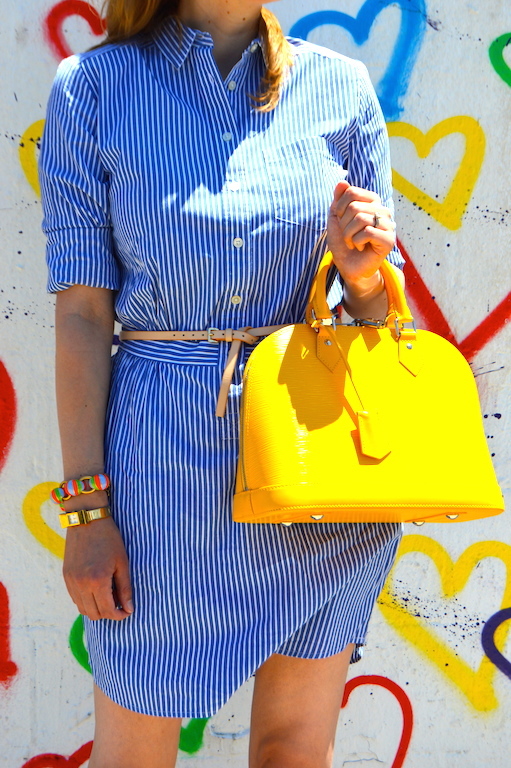 I love this wall you found and how your outfit complements it perfectly--love the crisp blue stripes and bright yellow! You always find the cutest places for photos!! Love this heart wall! Great look. 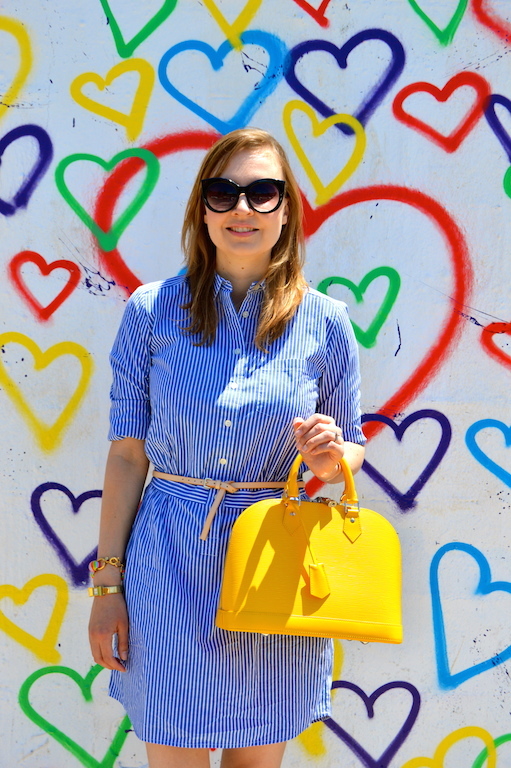 Love your bright yellow bag! I've always wanted a vertical striped shirt dress! Yours look simple but gorgeous! I love the idea of an adventure list. 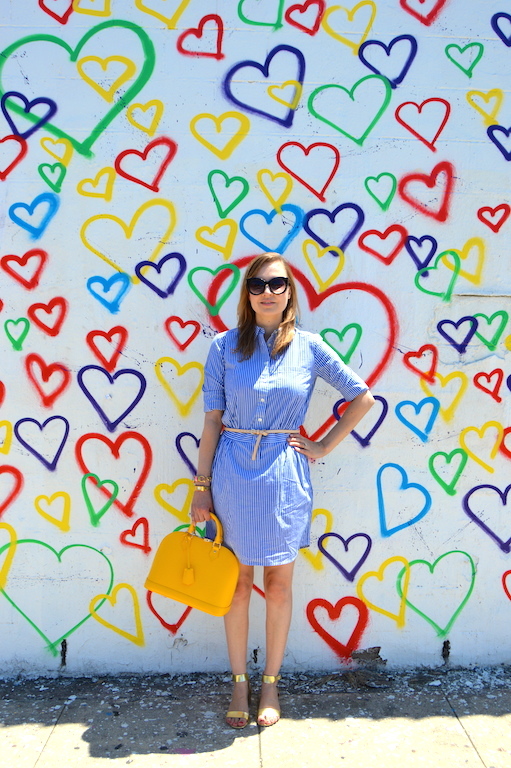 The yellow bag looks great with the heart wall. I hope you get to do a lot of your summer exploring in L.A. I like this wall and I hope you can find more! So adorable and love the pop of the yellow bag! Such a fun backdrop too! Thanks for joining in our Friday fashion fun & have a fab weekend! Absolutely love this shirtdress! And that wall is pretty incredible too!